Prospecting and Getting Customers to "Admit Pain"
The ability to stimulate the interest of prospective hiring managers and corporate buyers is the lifeblood of selling. Those who fail to master this skill will always struggle to fill and maintain the top of their sales funnel. This is by far one of the most challenging tasks for sales professionals regardless or product, service or industry. A survey conducted by Equation Research polled sales professionals about the most pressing challenges they face and over 50% of respondents indicated that “prospecting for new opportunities” was their top barrier to success. Another survey conducted by Chief Sales Officer Insights revealed that nearly two-thirds (64%) of sales teams need improvement in generating new leads. Market leaders, whether it be the staffing industry, manufacturing, software, financial services or any other industry all share one thing in common; their sales teams are a well oiled machine, operating in unison and consistently executing across the entire team. Their sales leader(s) consistently hire the same type (DNA profile) of successful salespeople who they consistently train and onboard to adopt the same skills, behaviors and knowledge and follow the same sales process and sales methodology and adopt common messaging and a call planning framework. There isn’t much deviation from rep to rep. Learn our proven 7 step methodology for turning cold calls into hot leads. In case you haven't heard, buyer behavior has dramatically changed. Buyers are empowered and more sophisticated and, thanks to the internet, are flooded with information and research overload. At the same time your buyers are searching—often in vain— for new ways to innovate, compete, and improve their success. When salespeople bring valuable insights and ideas to their buyers, they strengthen their relationships, differentiate from their competition, and win more sales. While it may be a new concept to you and many in the staffing industry, insight selling has been around for years and has been deployed by sales professionals in other industries including enterprise software, financial services and systems integration. Perhaps you have heard the terms "selling with insights, "challenger sale," "provocative selling," and others. Either way, they all essentially imply the same thing which is sellers sharing relevant insights with with their prospects to position themselves as a thought leader in order to quickly establish trust and credibility and move deals forward in a way in which traditional sales techniques cannot. The act of executing Insight selling supports and aligns with a consultative sales approach. Consultative selling represents a sales approach in which sellers disengage from pitching candidates and instead focus on sequencing strategic questions to engage in dialogue in which the customer reveals their goals and objectives and the challenges that lie in their way. Consultative selling also includes sales professionals sharing ideas, insights and best practices with the prospect on how to go about solving a problem or achieve a goal. By sharing ideas and insights the salesperson positions him or herself as an authoritative thought leader. With this approach sellers are able to challenge the customer's thinking, thought process, assumptions and beliefs and by doing so, effectively shape the solution. This is how consultative sellers create value and build trust with the customer. How do you sell? In all likelihood you have a sales methodology of some kind, whether you know it or not. For most sellers, they have their own preferred way of selling and typically it centers around the activities they are most comfortable with. But it doesn’t matter if you’re a entrepreneur, a sales rep on a sales team of one or part of a large enterprise sales team, every seller and every sales team has their own way of selling. So, how do you sell? Consultative selling is a sales approach in which identifying and discussing the needs of the customer including their challenges and issues are the focal point of the conversation and basis for the sale. 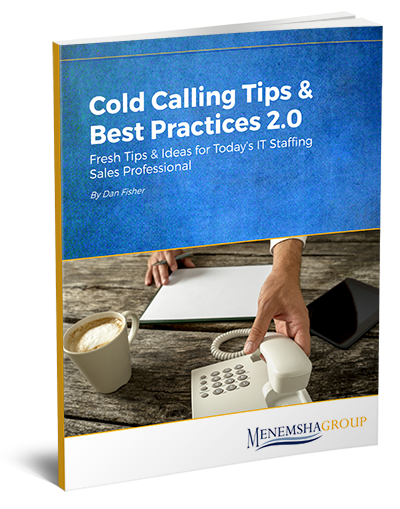 Adopting a consultative sales approach is critical for today’s sales professional because competing in today’s competitive IT staffing industry requires one to understand the changing world of IT hiring managers including the challenges they face and adapting their sales approach accordingly to drive meaningful value. In a previous blog post, Accelerating Your Customer's Hiring & Buying Process, I shared ideas on how applying project management principles including the use of a tool like the customer hiring plan can accelerate the customer buying process. If you recall, a customer hiring plan is a plan that accounts for all of the tasks and events that must be acted upon and completed including the decisions that must be made by you and your customer from the time the job order is qualified until the consultant’s first day of work. Not only does it account for all of the tasks, activities and events but it provides a timeline in which all must be completed by in order for the customer to start seeing business results in the time frame in which they need and expect to see them. Below I share with you infographics that highlight the benefits to both the customer and the salesperson for adopting a customer hiring plan. Download Your Free Copy of the Customer Hiring Plan What strategies are you and your team deploying to accelerate the sales cycle? What tools and methodologies are you apply to prevent stalled sales cycles? Let's start a conversation in the comments secion below. Studies show that sales leaders who operate with a consistent and repeatable sales cadence outperfom those who don't. Daily huddles, and a weekly sales forceast have become commonplace for most sales teams. As part of their weekly cadence, top sales leaders are now incorporating deal reviews into their operational cadence, especially for strategic accounts, highly competitive opportunities and must-win deals. In this blog post I'm going to share with you how to structure a deal review and the benefits of peer deal reviews.